The hook: History! (again) And “based on actual events” (again). 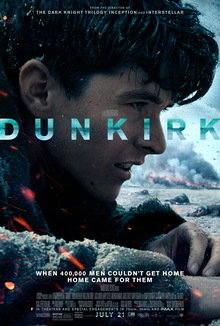 In Summary: World War II, European Theatre, Dunkirk. There’s not much to summarize since the movie follows English soldiers during the Battle of Dunkirk. Starting within the town of Dunkirk, to the beach evacuation, and all the way until the crossed the channel. Truth be told, I have no intention of watching this movie until I watched a preview of it during Guardians of the Galaxy Vol. 2. Never heard of it (or, if I did, I didn’t remember it) until then. And I’m not sure what drove me to the theatre to watch it (though I wouldn’t doubt the reason was that the other movies, four altogether, really interested me), but I am sort of glad I did. I say “sort of” because I do think I could have waited, but at the same time, it was so much better in the theater. Watching with an audience. And a big screen. And surround sounds. As mentioned, the movie follows English soldiers during the Battle of Dunkirk. The story does follow one soldier as a constant, but we follow his journey as he meets fellow soldiers and they all fight for their lives out of Dunkirk. The story is already there. Most of the work comes through in the presentation, which leads me to the next part. Historical dramas are a mixed bag for me. Not so much that I need them to be historically accurate (because, really, it’s not a documentary), to a point that is, but because there has to be a certain finesse that tells the story while captivating the audience. Sometimes it makes a really great movie, other times not so much. Dunkirk, to me, falls into the first category. It was a really great movie. Firstly, I love the introduction. It sets the stage to what you’re about to see. Multiple points-of-view tends to irritate me, but in this case, it enhances the plot. Each point of view tells just enough to keep you interested in the parallel story lines. Nolan shot and edited this movie with that finesse I talked about. He captured all aspects of that battle–escaping the town, waiting for the ships to carry you to safety, the enemy attacks that broke moral and killed hope, the civilians who risked their lives. He made sure to capture the emotions of all those souls involved–fear, hope, anger, desperation, determination. Of course that is waylaid if the actors can’t portray that. And they did. Fabulously. Which brings me to the next thing I appreciated about this movie, very little use of names. Lack of names draws you into the story than separate you. You are not watching Billy, the soldier but watching a soldier who fought for their lives, and everyone elses. He could have been your great great great grandfather or uncle or spouse. He could have had a family, been engaged, the only child. I read/heard that some people wished they showed more fighting on the French side of things. After all, the French held off the Nazis while most of the English, and some French, soldiers rushed to safety. A strategic move that allowed the Allies to stand their ground in the greater context of the war, from what I understand (and please correct me if I’m mistaken. Politely, please). While I agree that this movie showed very little of that, I’m not sure that was the focus. I’m not saying it wasn’t important, just that I think the movie was to show the evacuation in progress. I believe showing the French side would add at least another hour to the movie. Or could be a separate move altogether, one specifically on the regiment that held off the Nazis until capture to allow the other 330,000 or so soldiers to escape. That movie could follow this perspective and including the defense strageties that allowed the evacuation of Dunkirk. Since this is essentially a war movie, I wouldn’t add it to my collection. That said, I would recommend it to everyone (except children of course. You know, PG-13 rating). Maybe it’s because I live in the Pacific theater, but I don’t remember my history classes covering Dunkirk. I get there is so much to cover about World War II so things need to be dropped, which is why I’d recommend watching. It shows another event we may not even be aware of.